When the Android Nougat was first announced, it brought the multi-window support feature.The most of the people are aware of this split screen multi-window support enabled by default on all Android Nougat Phones. Also, there is a third multi-window mode present Android Nougat and most of the people wouldn’t aware of this feature“Freeform Window Mode”.This feature allows the user to add a third screen on their screen and this mode allows the present app can be moved and resized at will by the user.It’s essentially Android’s implementation of a Stacking window manager or Floating window Manager.Also, the Manufacture of the larger devices can choose to enable this freeform mode, in which the user can be permitted to freely resize the activity.If the manufacturer enables this feature then the device offers a freeform mode in additional to split-screen mode. 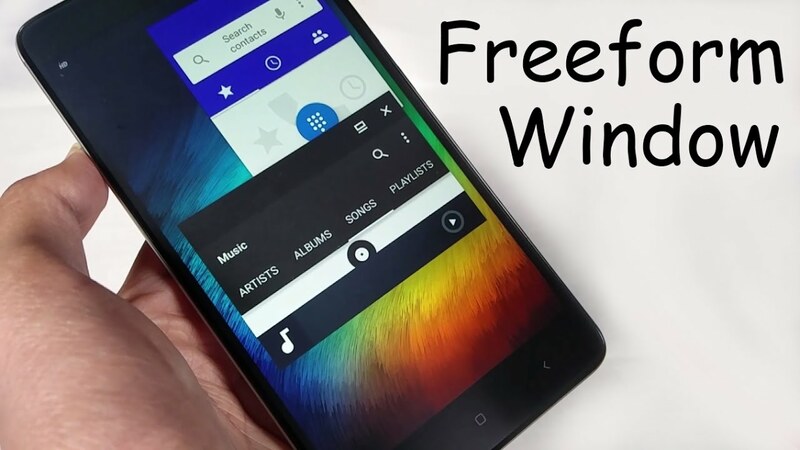 If you are want to enable this freeform window mode in your Redmi Note 3 or the Redmi Note 4.Firstly you want to install the Nougat in your Redmi Note 3 or Note 4.For Redmi note 3 there are two type Nougat the first one is “The Lineage OS “and the second is “The CyanogenMod 14”.But as we know the Redmi note 4 is the newly launched mobile So Redmi official release a Beta version of nougat the“MIUI 8 global beta ROM 7.1.19”.But these ROM of both phone is not official so you want to install the ROM by yourself. So let’s talk about how to enable the nougat freeform Mode, So there are two methods to enable the mode.So you Don’t need to worry if one method is note working then also have a second one.So let’s start. This method required a computer with ADB(Android Debug Bright) and if you don’t have one then, you would follow the second method. Step1: Before we starting any thinge, firstly you want to make sure that the USB Debugging is enabled on your phone.You can check for this by going to Additional setting and then go to Developer setting on you redmi note 3 and 4. Step2: Once it is of the way, then the next step is to connect your device to a computer with ADB installed. This method required no extra requirement and simply your device can be used to enable the feature.So you don’t need to do any extra thing. * All you have to do one thing is go to setting and go to Addition setting and then go developer option and enable the “Force activities to be resizable” the option is found at the bottom. The both of the Methode require the system to be a reboot that the feature to be enabled. If you enable the freeform mode using Methode1, then there will be a new button on app entries in the overview menu to launch an app into the freeform mode in your redmi note 3 or note 4. Then if you use the method 2 to enable this mode, then it is not possible to launch an app into freeform mode through android itself.Then it is possible by any third-party launcher to launch an app into freeform window mode using standard Android APIs that were finalized as part of API level 24. The key to launching an app in the freeform mode is to call the ActivityOptions.setLaunchBounds() method.This method takes a Rect as an argument, containing the window bounds that the app will launch with. You can then start the app will startActivity(Intent, Bundle).If you don’t already have an Activityoptions bundle, you can create one with ActivityOption.makeBasic() and then call setLaunchBounds() on the freshly created bundle. So if you do all thing then before starting to use this feature, you need to make sure that there is no app in the recent app menu.If there any app is running, then app you called for will simply go back to the full-screen menu and this feature won’t work properly.So you need to make sure that there is no app is running on the recent app menu. *App in freeform mode run in a stack which is separated from the system.Hence it is not possible for the freeform app to run of the launcher or on top of another full-screen app. *Also, some of the application is designed to behave well in Android standard split-screen window mode, will work very smoothly in freeform mode. But also you can download some third-party apps and use it in the freeform mode that will allow you to get a PC like an experience. Thanks you for reading this, I think it may help you. What a quality content I like it! !